How do I access CamSense? How can I change my payments preferences? How can I check my earnings for the current period? Where can I see the number of viewers I have referred? Why did you change the stats system I was used to? 1. How do I access CamSense? In order to be able to access CamSense you will have to go through the registration process. Once your registration is processed, you will be able to log in anytime. Some of the old Chathost accounts already have an assigned CamSense ID, that can be found in the *Revenue Details* section of Chathost Resources menu on CamContacts. Back to top 1. How do I get paid? Your referral earnings can be added to your Chathost account and you will receive all the money in one payment. However, if you prefer to receive your referral income as a separate payment either as FirstChoicePay or a bank transfer, you can modify your payment preferences. Back to top 2. How much do I get paid and when? You can earn up to 40% of all the revenues depending on which site you send visitors to, each 2 weeks. There is a sliding scale to reward effort and success. You'll be paid the full commission on the revenues in each 2 week payment cycle. Back to top 3. How can I change my payments preferences? Log in by entering your new referral ID in the 'username' field and your password in the 'password' field and clicking 'sign in' if you haven't done so. Go to payment preferences page (Your account > Payment Details > Payment preferences and then click the "click here" link at the bottom of page). 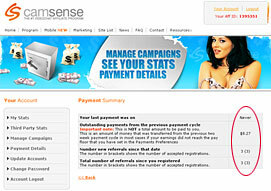 Click on the desired payment type. Follow the instructions and specify all the required information for the selected payment type in the fields below. Please keep in mind, if you do change your payment preferences to receive a separate payment for your referral income, all the bank commissions and surcharges will be applied to this payment as well. Back to top 1. How can I check my earnings for the current period? Your earnings for the current 2 week payment cycle can be seen on my stats page. In order to see stats for any given period, enter the start date and the end date in the respective fields at the top of the page and click Show. Back to top 2. Where can I see the number of viewers I have referred? 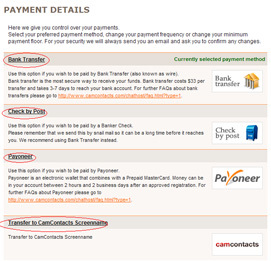 In order to see how many Viewers you have referred to the CamContacts site so far, go to the payment summary page. There you can see the number of new Viewers sent to CamContacts since the last payment, as well as the total number of referred Viewers. In the brackets you can see the number of Viewers with valid credit cards. This number can increase and decrease over the time (i.e. Viewer credit card can expire or become blocked and new credit cards can be added or unblocked). Note! You must be logged in to be able to see the number of referrals. Back to top 3. Why did you change the stats system I was used to?